It’s no secret that China is building bridges in both the literal and physical senses and it’s a consequential fact that their economy is blowing smoke in the face of their environment, and their population. 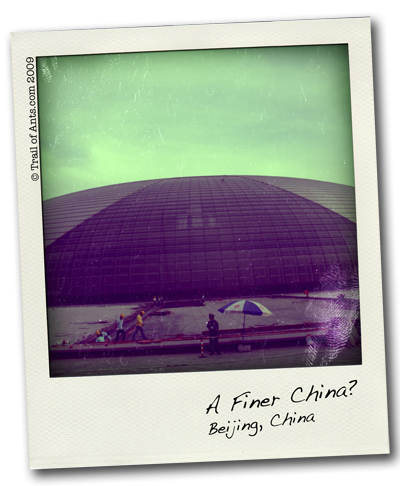 This weeks Reprint image is a soft example of pre-Olympic Beijing. As a visitor to China one of my lasting memories will be the ability to look at Beijing’s midday sun without having to squint my eyes. The pollution in Beijing is so thick some days that you feel you could scoop it out of the air with a spoon. It’s said that those breathing the air in Beijing are punished in the same way as those who smoke a packet of cigarettes a day. Cough. Wheeze. The Reprint shows the exquisite Beijing Opera house, a building that will surely become one of the more positive and enduring symbols chiming on China’s future. Previous post: Can’t Stand the Heat?